Memorial Church (MELISSA WEYANT/The Stanford Daily). Campus group Stanford Sanctuary Now (SSN) has been working to establish Memorial Church a “sanctuary church” for the undocumented community at Stanford, following the lead of churches around the United States that have promised to shelter undocumented immigrants fearing deportation in response to the Trump administration’s crackdown on illegal immigration. Since President Donald Trump’s inauguration in January and the move to rescind the Deferred Action for Childhood Arrivals (DACA) program, there has been a growing effort to establish “sanctuary” cities, churches and college campuses across the country. However, the movement at Stanford is complicated by the fact that Memorial Church is part of Stanford University, potentially implicating the university as a whole if it declares sanctuary status. The sanctuary church campaign at Stanford comes after University President Marc Tessier-Lavigne declined to name the university a sanctuary campus in February this year, stating that the term is not well-defined. While “sanctuary” does not have a legally precise meaning, cities that adopt the label limit their cooperation with federal immigration enforcement and generally do not use municipal funds to enforce federal immigration law, granting residents access to city services regardless of their immigration status. For college campuses and churches, the sanctuary label has largely amounted to a public commitment to implement policies that protect undocumented members of the community. At least nine colleges in America have declared themselves sanctuary campuses to date, including the University of Pennsylvania. SSN has been lobbying the Stanford administration for the past year to officially join their ranks – including protesting at a high-profile event during Admit Weekend – but the University has refused to adopt the name, announcing other measures to support undocumented community members instead. The sanctuary church campaign in the United States today has roots in a similar movement in the 1980s. The influx of refugees fleeing civil war in Central America during the decade saw over 500 congregations declare themselves sanctuaries at the peak of the movement. Since Trump’s inauguration and his subsequent efforts to tighten immigration enforcement and revoke DACA, an increasing number of churches have pledged to serve as sanctuary spaces again. At the Oct. 3 ASSU Senate meeting, Senator and SSN member Doris Rodriguez ’20 raised the possibility of passing a Senate bill that would declare Stanford’s Memorial Church a sanctuary church. For Rodriguez, creating a sanctuary church on Stanford’s campus is an important step in advancing the sanctuary campus movement. Although she is conscious of the ambiguities of the term “sanctuary,” Lead Resident Dean Lisa De La Cruz-Caldera, who has met with Rodriguez to discuss the issue, agreed that having a support system on campus for undocumented students is crucial. Nevertheless, efforts to make Memorial Church and Stanford University “sanctuaries” have seen slow progress. The sanctuary church effort is currently in its initial stages — Rodriguez is currently discussing the possibilities with administrators such as De La Cruz-Caldera and Stephanie Kalfayan, vice provost for academic affairs. 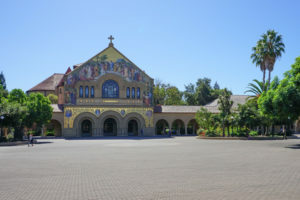 Reverend Jane Shaw, dean for religious life, said that no students have met her to discuss the possibility of making Memorial Church a sanctuary church, which she maintains is “only one option of many.” She added that the Office of Religious Life (ORL) will continue to protect undocumented students at Stanford regardless of whether it declares sanctuary status. “We will always do what is best for the most vulnerable students,” Shaw said. While Stanford has not officially adopted the sanctuary label, it has taken other measures to protect undocumented students, many of which are listed in President Marc Tessier and Provost Persis Drell’s open letter in June. For instance, the Stanford Department of Public Safety does not participate in immigration enforcement and does not allow enforcement officials on campus without a warrant. Since January, a new University working group has also been exploring potential responses to the issue, while Vice Provost for Student Affairs Susie Brubaker-Cole – a member of the University working group –will be holding weekly office hours to hear student concerns about immigration. Other recent measures include a website that provides information on legal and counselling services for undocumented students and free legal consultation for affected students, staff and local residents offered by the Stanford Law School. She pointed to other universities in California, such as California State University, Fullerton and University of California, Davis, which she says have been very successful at supporting the undocumented members of their communities. During a visit to University of California, Berkeley, De La Cruz-Caldera recalled feeling inspired by stickers around campus that read “I am an unafraid undocumented ally,” and wishing that Stanford students could make similar gestures. A potential barrier to the sanctuary church movement at Stanford is Memorial Church’s status. The church cannot act as an independent congregation since it is is subject to Stanford’s policies and regulations, potentially dampening Rodriguez’s hopes of establishing sanctuary status for the church as a means of encouraging the university as a whole to do the same. Moreover, Shaw was uncertain about whether such an initiative would be effective in the first place. “This is a real question – whether it’s the right thing to do or the wrong thing to do in terms of protecting the people, who are vulnerable people,” said Shaw. According to Rodriguez, the turbulent political climate at present is also a major obstacle to the sanctuary church movement as well as general efforts to support undocumented members of the Stanford community. She finds that it puts activists like her in “limbo”, as they “don’t know the legal feasibility” of specific proposals to protect the community. Like Rodriguez, De La Cruz-Caldera worries that “the Trump effect” is creating a culture of fear and uncertainty within institutions like Stanford that obscures fact and complicates concrete action. She added that declaring Stanford a sanctuary campus in spite of legal issues which may limit the extent of the University’s ability to protect members of the community could harm rather than help those in need. “The biggest harm that we can do to students is to promise them something that we cannot fully deliver on,” said De La Cruz-Caldera. While the prospects of making Memorial Church a sanctuary church seem unpromising now, De La Cruz-Caldera remained confident that strides can be made in protecting students with DACA status. “We’re in a time where our university has a lot of new leadership …[that is] listening and open to insight and feedback,” said De La Cruz-Caldera. Like Rodriguez, De La Cruz-Caldera believes that the challenges that come with defining the term “sanctuary” complicate SSN’s efforts in the immediate period. “We need some more well-defined language… before we can commit to offering 100% sanctuary,” she said. While she believes that SSN must clarify the meaning of “sanctuary” before it can progress, De La Cruz-Caldera added that the setbacks that the sanctuary movement has faced does not mean that the University is less committed to creating an inclusive campus. Contact Yasmin Samrai at ysamrai ‘at’ stanford.edu.